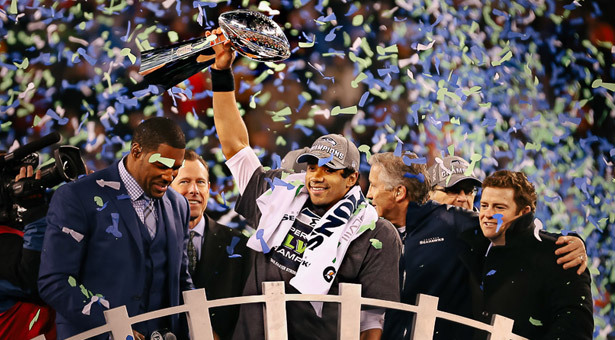 Seattle Seahawks quarterback Russell Wilson hoists the Super Bowl trophy just minutes after the Seahawks won Super Bowl 48. January may be a gloomy month in Seattle, but this year the whole city — Seattle Pacific University included — hardly noticed the drizzle. The Seattle Seahawks fought their way to the Super Bowl. And then, they won the Super Bowl in a landslide victory that brought locals together in a delirium of 12th-man joy. Grocery stores sold out of running back Marshawn Lynch’s power snack, Skittles. Construction crews hung massive Seahawks flags on cranes across the downtown skyline. School children learned about earthquakes in a new light: Seattle fans actually cause them, when they cheer loudly enough. Char Beck ’08 filmed Making of a Champion, a short movie illuminating the Christian faith of several coaches and players, including quarterback Russell Wilson. Melyssa Norris Stone ’09 directed her elementary music students in a Seahawks-themed “New York, New York” remake that landed them on the Today Show. And photographer Maurice Labrecque ’99 traveled to the Bowl himself, snapping epic photos at the game that Emerald City dwellers will never forget.